This is what the dryness has brought into our house this year. There must have been a nest nearby and they are coming in for water. I've literally only seen about 2 of these since I've moved out here, and now not a day doesn't go by when we don't kill at least one in the house. They move super fast and creep me out. If you didn't like bugs before, this puts them all to shame. I don't even care if I see a spider anymore as long as it isn't one of these things. As big as my thumb. It 'scurries' - climbs walls - terrorizes everything. They bite! But aren't poisonous. I'm scared to walk across the floor at night. Both Nate and I jump if anything brushes against us in bed (though we've only killed them in the bathtub and family room so far). How would you like to deal with this thing? We call them scorpion spiders, but aren't actually a true spider - though they are an arachnid they are more closely related to scorpions. They are also known as sun spiders or camal spiders. Those are big mandibles to chew on you with coming out of their head. They eat small rodents. I think I'm going to set off a bug bomb under the house. Scary! I don't think I could handle those bugs! Bleech... I don't like the look of them. Are they found on the front range and on the plains? Hope not! Oh my GOSH!!! OH MY GOOOOOOOSSSSSH! Those are terrifying. I hope they go away soon for you - EEEEEEK! That is one scary bug!! I can barely handle flies! You are a brave girl! Those are disgusting! And I had no idea those things even existed. Gakkkk! Ugh, that is one ugly bug! Hope they go away soon. I used to see those when I lived in the high desert in California. 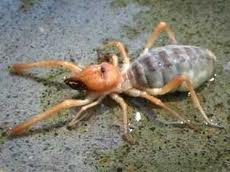 They called them scorpion spiders there too. My cat used to tell me they were around. One time he tangled with one and got sick. I found a mauled one and he wasn't feeling well. I don't know if he ate it or was stung but I stayed away from them!